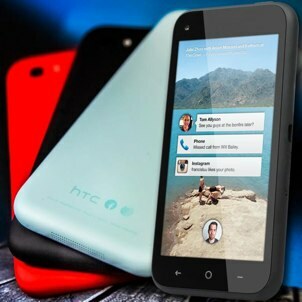 If you're a Facebook and social media maven, you may be eagerly eying the HTC First Facebook 4G Android Smartphone that was announced last week. Not only is it the first handset to ship with Facebook Home preloaded, but the HTC First is notably available at a lower-than-usual price point for a newly-announced smartphone. As tech-savvy consumers, we're accustomed to the traditional $199 price tag for a fancy cell phone debut. But AT&T is exclusively offering the First, in four colors, for $99.99 with a 2-year contract. Without a contract, it'll cost $449.99, which is still about $200 less than the base price of most most smartphones upon release. So is it worth buying? Reviews for the HTC First are still preliminary, but the general consensus is that, as far as the hardware goes, it's a capable mid-range smartphone. However, it's lacking the whizz-bang-flash that we've seen with some of the hotter smartphone releases of late. Slash Gear notes that, although the focus of the HTC First is on Facebook, "the hardware does remind us of another phone: the HTC One S." Unlike the One S, however, the First has a plastic "soft-touch" body and a smaller 4.3" screen, the latter of which the publication actually prefers to the increasing trend towards 5" phablet territory. The screen resolution is 720p, which is less than some other notable releases like the Samsung Galaxy S4, but Slash Gear points out that it's "more pixel-dense than an iPhone 5," and PCMag calls it "sharp." The HTC First features list is rounded out by a Snapdragon 1.4GHz dual-core processor, 5-megapixel rear camera, and 1.6-megapixel front camera. It comes with 16GB of internal storage, but there's unfortunately no microSD slot for expandability. But let's be honest: no one is interested in the First because of the hardware. It's the inclusion of Facebook Home that's getting all the buzz. The skinned version of Android 4.1 (Jelly Bean) puts Facebook "front and center" by replacing the normal home screen with a live feed of Facebook updates, thus shoving the appscape to the background. ABC News calls the design "polished," as users scroll through photos overlaid with news from Facebook friends. There's also the amusingly-named Chat Heads function that lets you carry a conversation with a friend across all activity on the phone, rather than having to switch back and forth between the message thread and whatever it is you're doing. Most publications seem to agree that this is the most ingenious part of Facebook Home, as it allows for effective multitasking. Interestingly enough, despite all the focus on Facebook's skin, the OS is otherwise just a stock version of Android; since you can disable Home at any time, the First is actually ideal for Android purists, according to CNET. While HTC clearly wants to remind you that the First is, in fact, the first phone to ship with Facebook Home, consumers should remember that the Facebook skin is available for other Android phones as well. With that in mind, readers, what do you think of the HTC First? Will you buy it? 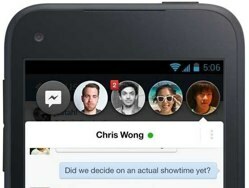 Will you update your Android phone to Facebook Home? Sound off in the comments below.